Crowns : This procedure places a prosthesis over damaged teeth or implants to extend the longevity of the tooth. Veneers : A thing lawyer of porcelain can be used on top of existing tooth to enhance your overall smile and protect teeth from damage. Implant dentistry : We can replace the natural root of nonfunctional teeth with an implant. A prosthesis can be installed on top of our application for aesthetic purposes. Endodontics and periodontal plastic surgery : Endodontics focuses on the tissues within a tooth. If left untreated, infected dental pulp can cause severe pain and deterioration. Halitosis treatment : Halitosis can produce “bad breath,” and may indicate periodontal disease. Whether it is caused by poor hygiene or gastrointestinal disorders, we can treat it! General hygiene : Route cleaning and general oral hygiene can remove plaque and calculus around teeth. These are the most effective preventative measures. IV sedation : Dental treatments may cause you stress of anxiety. IV sedation allows patients with fears to receive the treatment they need without the added anxiety. Full mouth restoration : We can fully restore your mouth with effective treatments that not only address your oral health but the look and feel of your smile as well. Smile makeovers : Have you felt self-conscious about your smile? Our smile makeovers can help you feel more confident and prevent damage. 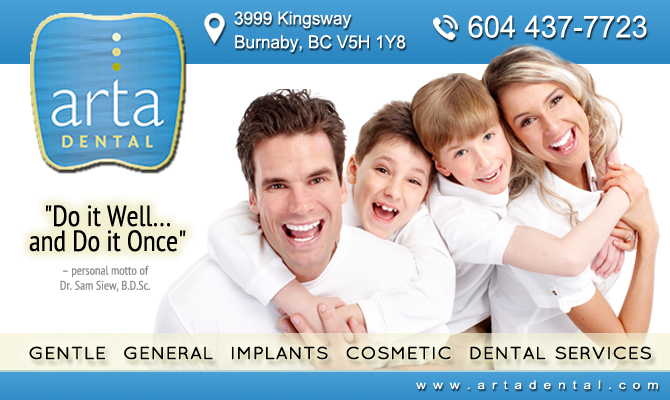 Whether you are searching for an experienced dentist our Burnaby dentist can assist you. Call us today at (604) 437-7723 to request a free consultation!